Here we have an Ingraham mantle clock. This clock wanted to run when it was brought into the shop. But it could not. Removing the movement from the case showed that it was very dry. It has not run in a very long time. The movement was not too dirty but showed significant wear. The picture below shows the movement apart with the worn pivot holes marked. This image shows 14 pivot holes needing rebuilding. 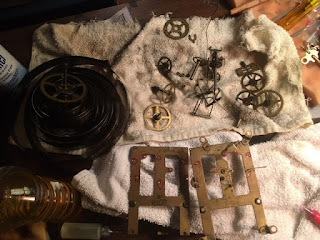 Here is the movement cleaned and ready for assembly. Once the clock has been assembled. I run the movement outside of the case to make sure the movement is performing as it was designed. Here is a short video of the movement running. As you can see the motion (pendulum swing) is very good. Here is a picture after the case has been oiled.The case was wiped with a moist cloth before wood oil was applied. The cloth was full on what looked like brown "yuck". This "yuck" is a result of cigarette smoke.